Houses & Homes VA: 5 Super Easy Ways to Increase Kitchen Storage Space! 5 Super Easy Ways to Increase Kitchen Storage Space! I understand. I couldn’t find a pink elephant under my kitchen sink before I learned this cute little trick! There are two different options here. First you can buy one of those nice white racks at the home improvement store that is made to screw onto the inside of the cabinet doors under your sink. Ingenious! Now you can store those hard to find items like trash bags, sponges, brushes and so on! If you prefer, you could even make your own by cutting any type of plastic tub or container. I actually saw this done with the bottom half of a gallon milk container and it didn’t look bad at all! This is one of my favorite storage ideas. You can add a simple shelf above doors in your home for a very useful cubby! Use your imagination for this one. 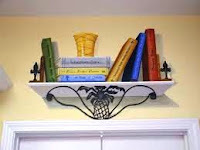 A nice shelf for recipes and cookbooks in the kitchen, a towel rack in the bathroom, laundry supplies, an extra blanket in the bedroom… ; The ideas go on forever and provide a lot of convenience for those things that you use most often. You already know that you can’t have enough counter space in the kitchen. Here’s a cute idea that you can use to make a little extra room. The end of one of the upper kitchen cabinets is a perfect place to hang a nice wire basket for fruit! It looks very nice and makes grabbing that healthy snack a breeze! 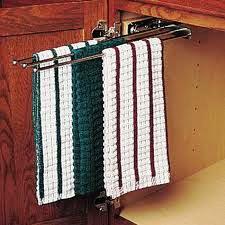 Have you ever seen those pull out towel racks? They are made to be installed on the inside of your kitchen or bathroom sink cabinet and are the perfect place to hang hand towels, washcloths, dishrags, etc. The perfect way to dry damp clothes and eliminate clutter at the same time! An Awesome Way to Organize Those Kitchen Cabinets! If your kitchen is like mine used to be, it takes more time to find everything than it does to use it! You can add smaller shelves in-between the big shelves in your kitchen cabinets and get super organized! Now you can store spices and other small items and save a ton of space in your cabinets. Everything is right at your finger tips and you’ll never have to wonder why you have 5 containers of ginger again! I can understand that in a small home storage is the main problem. As I also have a small home but I used to organize and manage each and everything and for this I have made a storage plan which help me a lot in my home organization.